Q: What types of files do you accept? We accept files in both Mac and PC formats. Vector files (such as Adobe Illustrator) are needed for cut-vinyl applications. Vinyl graphics cannot be cut from jpeg, gif or other rasterized files (such as tiff, Photoshop or eps). Both vector and raster files may be used for large-format output. Raster files for large-format output should be created at 150dpi at final output size for best quality.Please DO NOT save large-format files higher than 150dpi – doing so will not increase the quality of the final product. All fonts should be converted to curves or outlines to avoid output issues. If you are unsure about your files, please don’t hesitate to call us at 805.792.SIGN. Files created in programs such as The Print Shop, Microsoft Publisher, Excel, PowerPoint or Word are NOT acceptable formats for output. Files created in these programs will need to be re-created for output, and will incur additional design/setup fees. Q: What is the difference between a raster and a vector image? Raster images are made up of individual pixels, and the size of the image is constrained by the number of pixels present in the file. For example, think of a digital photograph. You can usually enlarge a photo from your personal digital camera to about 8×10 without any distortion or blurring of the image, but if you try to make a large poster with the photo, it may start to look blurry and effect the quality of the image. Vector images are made up of a series of points connected by straight or curved lines. These points and lines are associated to each other both geometrically and mathematically allowing the image to be resized over and over again with no change in image quality. Q: I have a pdf file, will that work? It depends on the application. For cut vinyl, your pdf must be in vector format. For large-format printing, your pdf file must be either vector based, or 100dpi at final output size. If you are unsure about your file, please send it to us, and we will take a look at it for you. Yes! We accept VISA, MasterCard, Discover and AMEX credit or debit cards. Q: Do you have a price list/how much do you charge? Most of the jobs we produce are custom or made-to-order, however, we do have some standard prices for common items. Please contact us and we would be happy to provide you with an estimate for your project. Our shop rate for design and installation is $75 per hour. Q: How long will my sign take? It really depends on the size and complexity of your project. 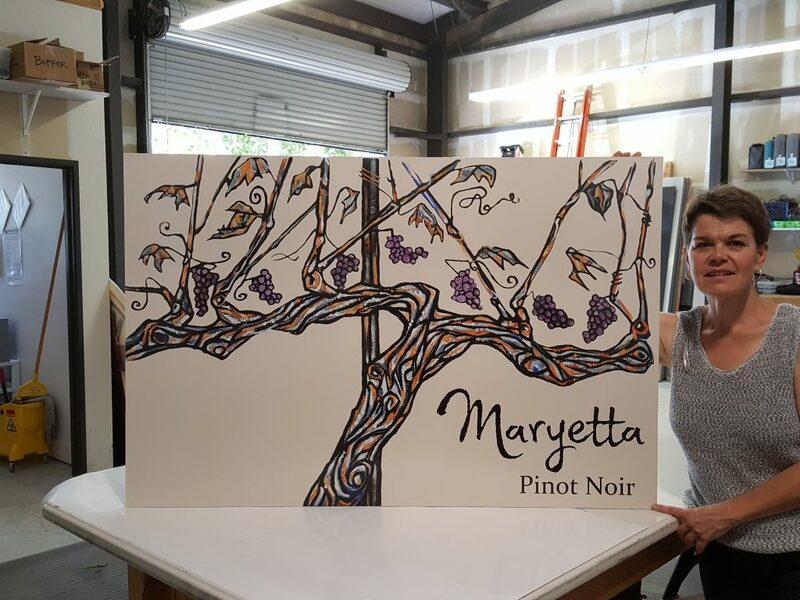 For example, most banners can be completed within one day, but sandblasted signs, dimensional lettering or etched metal can take anywhere from four to six weeks from the time a design is approved. (This does not include time for completion of the city permit process). Regulations vary from city to city. In general, you do not need a permit to hang a banner, put graphics on a storefront window or set up a sandwich board, but there may be regulations to follow. Please check with your city’s planning department for more information. Q: Can you help me obtain my permit if I need one? Absolutely. We can handle the entire process, or we can provide you with the necessary drawings to submit to your city planning department. (Please note, this service does incur an hourly charge). Q: Can you install my sign for me? We install window graphics, vehicle graphics, banners, dimensional letters or other non-electrical signs. Signs that require electrical or any special equipment to install must be installed by a licensed contractor. We can refer you to one or arrange the installation for you. Q: Can you put new graphics on an old banner I already have? It depends on the size of the graphics that need to be replaced and the overall condition of the banner. 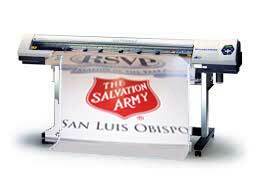 If the old graphics cover a large area, it may be more economical for you to order a new banner. The labor costs involved in removing old graphics and cleaning the banner to prepare it for new ones can often exceed the cost of purchasing a new banner blank. If you’re not sure about your banner, just bring it in and we’ll let you know if it’s worth re-using. Q: What about an old sign face, can you put new graphics on that? Just as with a banner, the labor costs involved in removing old graphics and refurbishing a sign face to prepare it for new graphics can drive up the price. If you’re not sure about your sign face, just bring it in (or we can visit your location) and we’ll let you know if it’s worth re-using. Please call us at 805.792.SIGN or email us at info@allsandg.com with any other questions you have about our products and services. 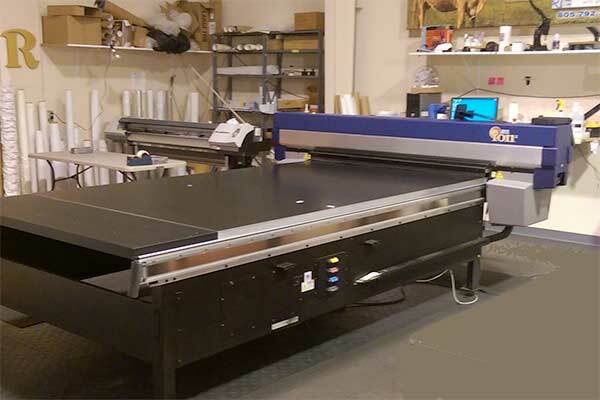 The Roland VersaCAMM VP-540 allows us to print full color graphics directly onto banner material, adhesive-backed vinyl, paper, films, fine art materials, and numerous other flexible roll substrates. It also allows us to contour cut graphics in-line, so intricate shapes and details for vinyl graphics are no problem. The possiblilites are endless. The Eco-Solvent inks have an outdoor durability rating of up to 3 years (unlaminated) and 5 years (laminated). The newest addition to our equipment lineup, the Gerber Solara Ion, allows us to print directly on almost any solid substrate up to an inch thick. The UV inks have an outdoor durability rating of up to 3 years (unlaminated) or 5 years (laminated). We offer many products to fit your needs. If you don’t see what you’re looking for on this list, email us at info@allsandg.com or call us at 805.792.SIGN for more information. 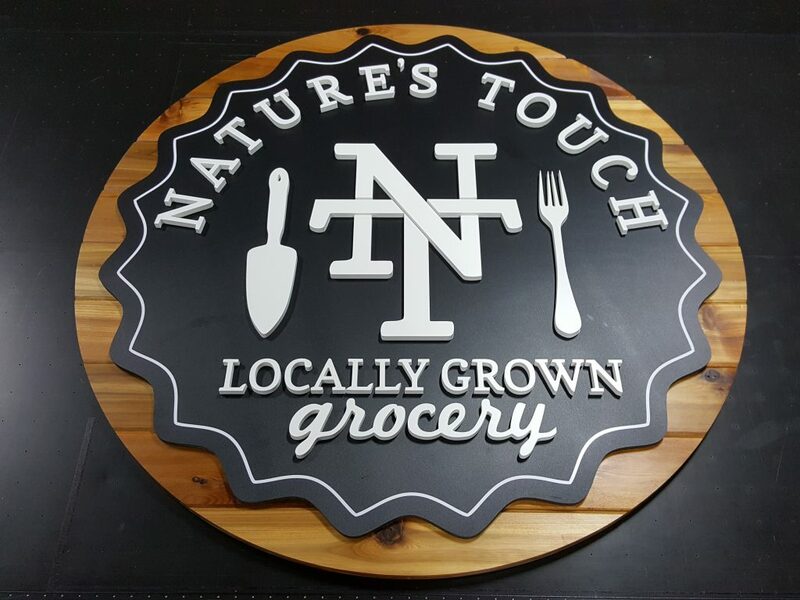 Need help creating your sign or graphics? We can design your project from start to finish including logo design. We can also assist you with the design and production of print materials, such as brochures, business cards, stationery sets or advertising, for your business. If you’d like to see samples from our print design portfolio, please contact us.